We go on holiday tomorrow so won’t be around for the North Show. However, I have prepared something earlier! 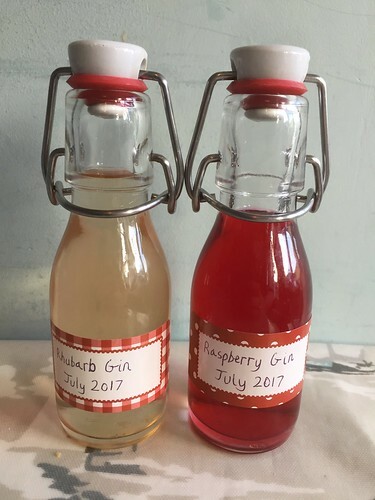 I dropped my flavoured gins off at my friend Emma’s house so she could enter them for me. Fingers crossed I will be a winner! 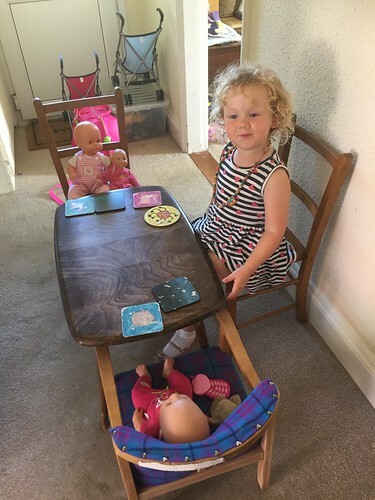 I caught The Little Miss dragging the table and chairs through to the lounge and when I asked her what she was doing she told me ‘I’m having a tea party for my dollies’. As he went to bed this evening I asked The Mister what the best bit was about today. He sleepily muttered ‘Auntie Louise picking me up from holiday club’. 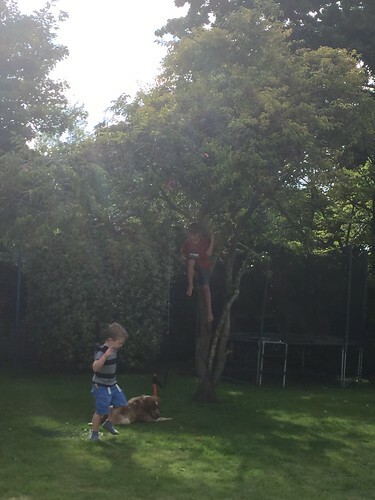 She picked them up, the children played (mostly) nicely together and they had a lovely time. Thanks little sis for being a fabulous aunt. I didn’t take any meaningful pictures at all today so here is a flashback to last Sunday. 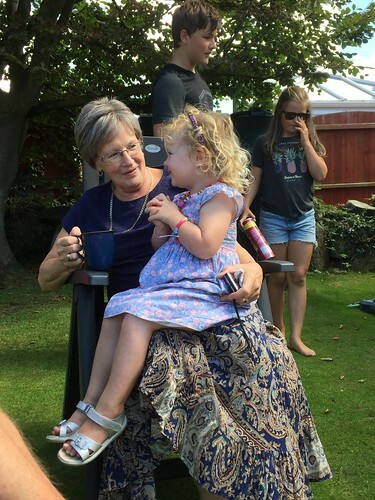 This is my wonderful Auntie Jenny with The Little Miss. I have been hugely fortunate to have lots of amazing aunts and Auntie Jen and her twin Auntie Josie have been like additional mothers to me. Auntie Jen has been quite poorly recently so it was so lovely that she managed to come out, and even bring one of her legendary apple pies! This afternoon we went to Vazon to watch the sandracing. 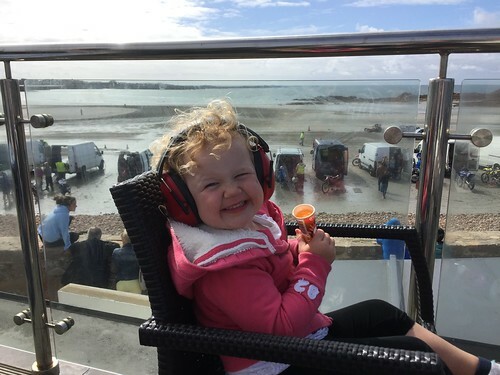 The Little Miss managed to fall asleep for a little while on my lap but she made a full recovery in time for an ice-cream on the roof of Vistas cafe! It has been a funny sort of day – the weather has been a bit unpredictable. 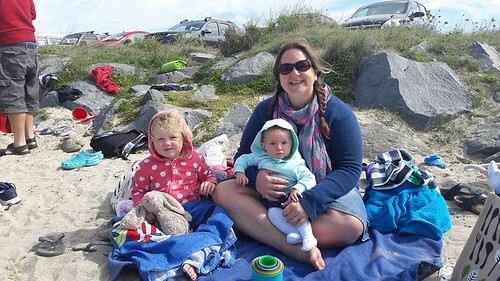 I met my sister and some of my cousins at a little beach called Les Amarreurs and I was planning to go in for a swim. However, it was pretty windy down there and I decided it was a bit of a stretch to go in! The Little Mister donned a wetsuit and went in with some of the others though whilst The Little Miss and I sat and played with my cousin’s daughter Cora. 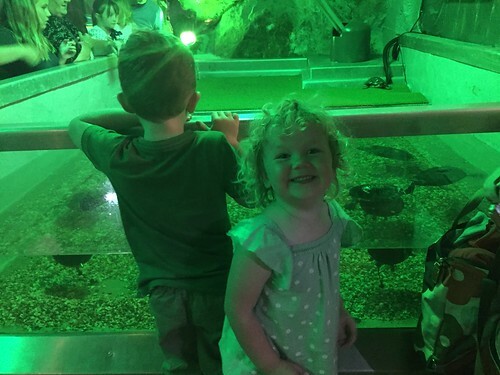 The weather has been a bit ropey today and the childminder sent me this picture of the kids at The Aquarium. They haven’t stopped talking about their visit since they went! When I was growing up there were always a couple of elderly ladies in the church congregation at Eldad Elim Church who were always there. I remember them vividly as a child. One of them was this wonderful woman, Myra. She has been around forever. A huge encourager and faithful attender she has been rather wonderfully there in the background, ever present. 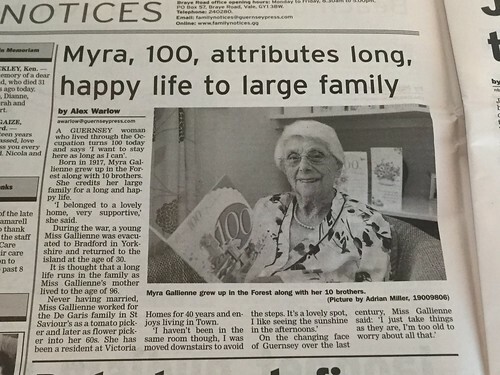 This was in the paper today – her 100th birthday. What a wonderful tribute to her. I have to admit that I took this yesterday on the Scarecrow Walk. Just something else that we managed to squeeze into a very busy Sunday! 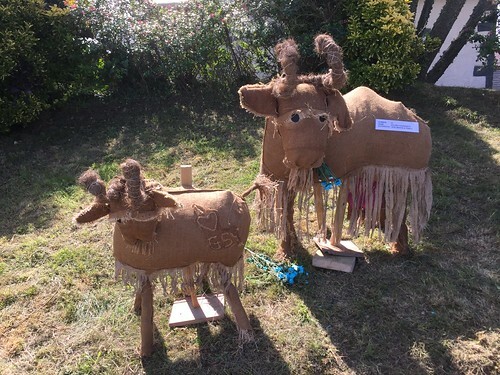 I loved this display – sacks made into Golden Guernsey Goats. Very creative! 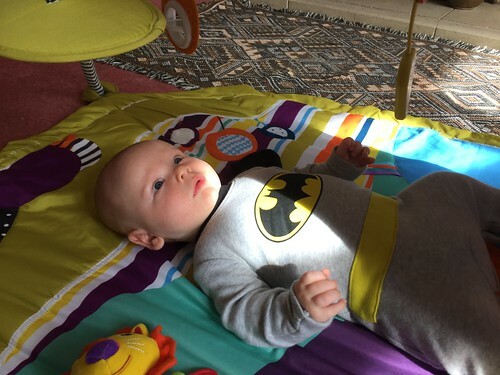 It has been lovely to see my cousin Sam and his wife Sally and their gorgeous little boy Cassian. He is a delightful little thing and the kids enjoyed playing with him.